Nada Herman was born into an artistic family. Her grandfather was the late and great Sali Herman, who was famous for his depiction of Terrace Houses and the Sydney slum houses.Nada's father was also a well known artist. Ted Herman, who tutored and inspired Nada from a very early age of eight years old. She won her first art prize at ten years old. All through Nada's youth she was taught and observed by her two older teachers. At one stage all three of them worked together in her bushland studio which overlooks Pittwater in Sydney Australia - a beautiful place to paint from. In 1987 Nada finished a certificate in visual art receiving honours in painting. In 1990 Nada graduated from a batchelor in visual arts. In 1992 an exhibition titled 'Three Generations' was held and it was Nada's first chance to show her work. It was to be the final exhibtion for her grandfather as he past away a year later at 95. The 'Three Generations' show was a great success and from then on Nada's style began to grow and develop with more and more confidence and expression using loads of oil paint and vibrant colours. Nada has had many solo and joint exhibitions throughout the past 22years. 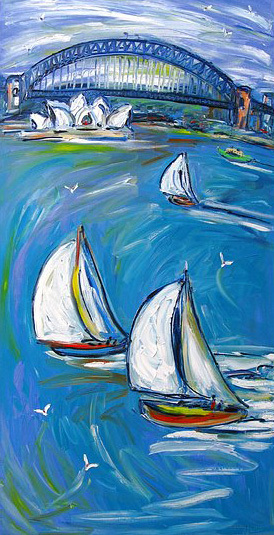 Her paintings are now in great demand from art collectors and galleries throughout Sydney as well as worldwide. Thick brushes are a necessity in Nada's style as well tins of oil paints and a palette knife. The palette knife creates a fresh painterly quality and is perfect for painting wet over wet without the colours becoming muddy. 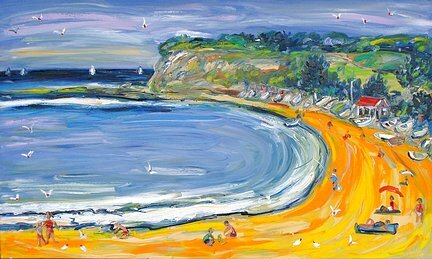 The colour and excitement in Nada's work reveals her love of the area in which she lives and the beauty found within the bush, marine life and beaches. Still lives fascinate her with their stagnant yet energetic appearance. A humble flower can create so much joy and power in Nada's eyes as can an apple in a bowl of fruit. Beaches are full of subject matter with their lovely bathers and the ever moving waves, seagulls and sailboats. Everyday is different and Nada adores painting beach scenes. 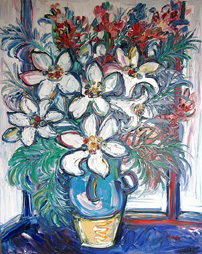 Her life long passion for painting has developed into an expressive, flamboyant style full of texture, colour and depth. Many local and overseas clients enthuse about her wonderful colourful paintings, which bring joy and colour into their homes. Nada exhibits annually from her parents unique home / studio in Clareville NSW Australia. The property called "Hy-brasil" has a historical 1930's sandstone house, nearly 3 acres of panoramic views, natural bushland and beautiful fish ponds, gardens and interesting subject matter for an artist. Internationally Nadas work is on exhibition at Agora Gallery New York and Vivid Arts Network Italy.